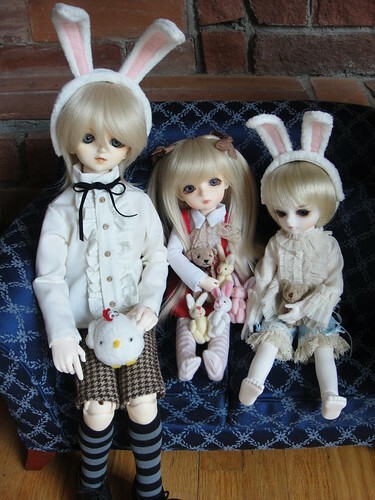 I invited whitefrosty and Machiko over to my house for a little doll party. Since I was busy hosting I didn’t get a chance to take many photos, so most of these are gacked from whitefrosty’s blog. 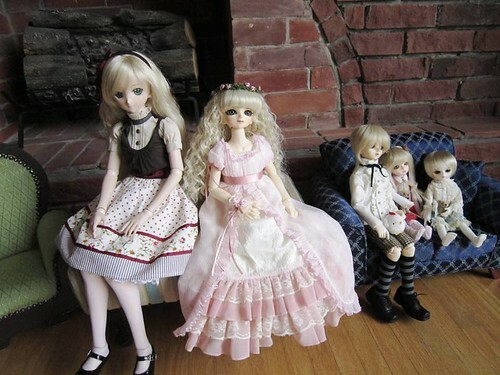 Here are a few of the dolls: my Saber Lily, my sister’s dolls Zephyria, Ventus and Delilah, and whitefrosty’s Myles. Here are Ventus, Delilah and Myles – the blondes!~ hehe! And notice something?! She’s got both shoes from her default outfit now! Hurray! And here’s Myles and Delilah rocking out in their Volks ducky suits! I could die from the cuteness! 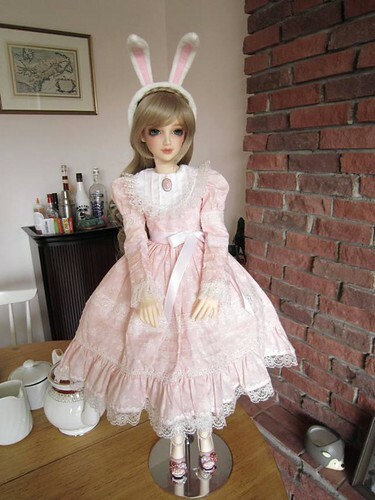 This entry was posted in BJD Misc, Dollfie Dream, Volks Super Dollfie and tagged Alisanne, Daria, Dollfie, Dream, Lily, MSD, Saber, SD16, Volks by archangeli. Bookmark the permalink. Cute baby chicks! I want one 🙂 I love tiny things sooooooooooo much. That is why doll stuff makes me happy sometimes.